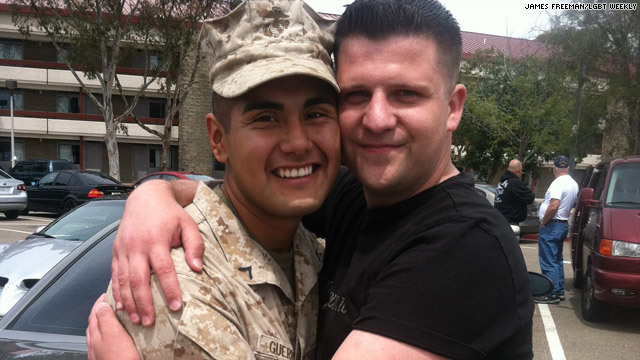 Gay Navy veteran proposes to Marine boyfriend…and he says yes! You are at:Home»Navy»Gay Navy veteran proposes to Marine boyfriend…and he says yes! Cory Huston liked it so he put it a ring on it. Huston, a Navy veteran who was other-than-honorably discharged in 2006 after a chief found out he was gay, proposed to his boyfriend Avarice Guerrero, a Marine who just returned from Afghanistan, at Camp Pendleton according to San Diego LGBT Weekly. It was the first public proposal between two men on a military base. “I realized we made it through [this deployment], and I just wanted to show him how much I loved him and that he was the only one I wanted to be with,” Huston told HLN TV. Though Huston did not propose for the publicity, he and Guerrero have appeared on CNN. Now, the couple would like to use their story to inspire others to be more open. The couple is waiting to get married until Huston finishes his bachelor’s in nursing. Congratulations. As a Navy personnel manager during the Gulf War of 1991, you can bet I know your pain. I had to get out in order to sell my book. I encourage you to consider reading my book about suffering in the closet while the bigots ran free; and I wish you both all the very best for your lives. WTF….I sit here and read this and think WTF really? I feel this should not be NEWS worthy at all and we need to bring back the don’t ask don’t tell…God forbid if i had to be in close quaters with someone like that, Now some of you think what i’m saying is wrong but what if the Military allow males and female to shower together or share rooms…some of you who support this would say it’s wrong so lets be real it’s worng and thats that!! !